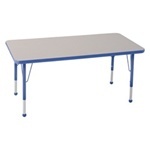 ECR's Rectangle Color-Banded Adjustable-Height Activity Table stands up to years of use and abuse in your elementary classroom. This scratch- and stain-resistant particleboard table is laminated on both sides, so it's a cinch to clean. Colorful edge banding won't chip or pick away and rounded corners keeps kids safe. The matching polypropylene ball glides protect your floors, and the powder-coated steel legs adjust in 1" increments to accommodate children as they grow. Choose either a gray top and your choice of four edge band colors or a woodgrain top with black edge banding.